An extravagant and glamorous trip to Capri in the years 1919/1920. A refuge for intellectuals, aesthetes, musicians and the adopted home of a lesbian homosexual colony with guests from all over the world: In those years, cosmopolitan eccentrics and Haute Volée in their grand mansions on the cliffs overlooking the sea populated the island of Capri, which was once a favourite retreat of the great Roman Emperor Tiberius. 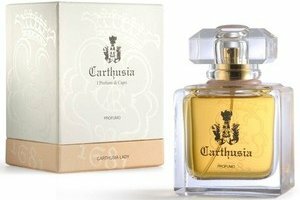 At that time an artist and intellectual commissioned the House of Carthusia to create an extraordinary fragrant composition. A perfume that would capture the harmonies and contrasts of this legendary age yet coupled with the unique and fascinating appeal of a Medusa. The notes include violet, bergamot, ylang ylang, jasmine, muguet, iris, peach, sandalwood, patchouli and white musk. Carthusia Lady is available in 50 ml Parfum. * And presumably, reformulated, but I do not know how closely related it is to the brand's prior scent of that name. I usually don’t comment about perfume copy, but this one REALLY confused me….is this a perfume inspired by “lesbian homosexual” colonists? Well… maybe it sounds posh to Italians! There are a couple of very good novels by Compton (Monarch of the Glen) Mackenzie that touch on that colony: Vestal Fire & Extraordinary Women. This is a truly lovely line – a line for those days when you don’t want to smell “perfumey” just beautiful. IO is one of my favorites. So my first thought is a that this “male line” was going to produce something for women, great!. But then, oy such copy! Is this for an intellectual refugee? A “lesbian homosexual*” who wants to smell like a monster with snakes for hair, who loves to welcome house guests? I suspect that some house guests would pass on the invitation. * Are there any heterosexual lesbians? HAAAAHAHAAA…. I love NST commenters like you, Dilana. The ridiculous redundance of “lesbian homosexual” escaped me on first read. Maybe that’s for readers who might mistakenly think it was an artist colony of people from Beirut. It’s all pretty funny. I love the fact that they needed both lesbian AND homosexual, in case one or the other wasn’t clear. That said, I do think Carthusia generally does a good job — not exciting, but competent. Mediterraneo is still my go-to summer citrus. It’s basically a lemon / lemon verbena scent…there isn’t much more to it than that. I just love it. BUT, haven’t tried it lately so perhaps it is reformulated. Oh that copy!!!! It would be interesting to see the original Italian copy – I wonder if this is just a really bad translation!? Too funny. Oh, that could be it! I bet it is just a truly horrid translation….. so in Italian it’ll be merely stupid copy. But this, this is hilarious copy! Holy gobbledygook Batman! Homosexual lesbians had me laughing- is there another kind? Tiberius- very bad guy who should have run into the Medusa :not a great emperor. Medusa- who wants to smell like someone who had snakes for hair and turned people into stone with a look? That said, I would like to smell this but am a bit wary of the peach note. And Carthusia Donna sounds so much better than Carthusia Lady- lady makes me think of Little Britain ‘We are Lay-Dees’! Not to mention that some Lesbians really do not want to be thought of as “Ladies” which can imply a somewhat precious and confined definition of womanhood. Agree, Donna would be better. In English, anyway. Trying to recall my college Italian, I am wondering if the original copy in Italian used “grande” and it was translated as “great”. But it can also mean large, important, or powerful? Or maybe they thougt Tiberius was great compared to Caligula and Nero? I really like the Carthusia line, – especially Mediterraneo and Io Capri. However, this copy is so stupid. Yeah, Lady is a terrible name for it. I can only assume something is very much lost in translation in this description. Fascinating appeal of a Medusa? Huh? what on earth is appealing about snakes and a wrathful woman? Ick. Actually, I love Medusa as a symbol and icon. But then I’ve never been what you might consider “normal”. lol! The myth itself is troubling and a head-scratcher for me. She’s a priestess of Athena and is raped in the temple by Poseidon and a p.o.’d Athena turns *her* into a Gorgon? Sheeesh! Late night in the ad copy writing room……many drinks were had…. Hey, a good reason to look for an ad copy job for me – night owl hours and drinking at work! Woohoo! yeah, I know….there’d be a line to sign up for that job! Oooh, that may have replaced “Ice Cream Taster” as my dream job. I do like Carthusia IO Capri, so if I run across this one, I’ll give it a try. Medusa in peach? I think not. Dunno, I can kind of conceive of her in something difficult, like Mitsouko, though, granted, it wouldn’t be her signature scent. While the juice could be delightful, the print ad nearly made my eyes roll out of my head. Inspired by art, intellectuals, and lesbian colonists? In that case, shouldn’t it have “Sappho” in the name somewhere? I know! I was laughing because it seemed like they were saying “hey you… you smarty-pants lesbians….this one’s for you!” so I guess this makes me a stupid heterosexual and I feel discriminated against! I think I’d go for the “Sappho Femme,” kind of rolls off the tongue. I picture it being an oceanic floral. Also, I thought Carthusia was made by monks? I guess that order is down with taking commissions from lesbians (or was back in the 20s)? Interesting on so many levels. This could be the subject for half of a university lecture. I like Carthusia too, especially Via Camerelle, and I’d happily sniff this if it came my way. Juice Sounds LUSCIOUS! LOVE PEACH in anything (Mitsouko, Anyone….????) and Ylang-Ylang, Iris and Muguet… OH HOW LOVERLY! Although I don’t know Italian well enough to give a really good translation, I know enough when comparing the English and Italian text to see that the translation is not one of the best. The reference in Italian is not to homosexual lesbians but to homosexuals and lesbians.